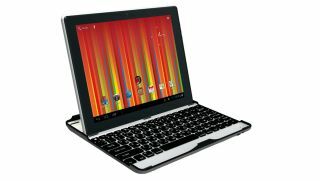 UK based, mobile consumer electronics brand, Gemini Devices has launched the new JoyTAB Gem10312BK, a 9.7" Tablet PC sporting a Bluetooth Keyboard Case and an IPS display aimed at the small business market. The Bluetooth keyboard case holds the Gem10312BK in a comfortable typing position, just like a laptop, and protects the tablet from scratches when not in use. The Ice Cream Sandwich based device is lightweight 632g (952g with keyboard) and measures less than 1cm (including the keyboard) and is armed with an ARM Cortex A8 processor, a 9.7" IPS Capacitive Multi-Touch screen display, 1GB DDR3 memory, and 16GB of built-in storage with room for 16Gb more via a Micro SD Card. The Gem10312BK includes two cameras, a front-facing 0.3 megapixel camera, and a 2.0 megapixel rear facing camera, and has options to connect via Wi-Fi, Bluetooth, USB, or HDMI. The RRP is £199.99 and the tablet comes with a one year warranty. As of this week NovaStor's NovaBACKUP range has been upgraded to fully support Microsoft's latest business networking product, Windows Server 2012. As well as the basic NovaBACKUP Server product NovaStor has also updated it's NovaBACKUP Business Essentials, and NovaBACKUP Business Essentials Network. The new version of NovaBACKUP Business Essentials offers file and disaster recovery protection support for Windows Servewr 2012 as well as, the ability to backup and restore Microsoft Exchange and SQL data, as well as unlimited virtual machines based on Hyper-V and VMware ESXi / vSphere. NovaBACKUP Business Essentials Network also gets an upgrade to Windows Server 2012 and adds the ability to centralise the management of data protection for an entire business network from a single intuitive web interface. The new MiniStation Thunderbolt portable hard drive from Buffalo provides transfer speeds of up to10Gbps, double those provided by USB 3.0 alone. The new device is compatible with all Apple MacBook and Mac computers, and is soon to be joined by a host of Windows devices with Thunderbolt compatibility. Buffalo claims the device is the world's first to have both a 5 GBps super speed USB 3.0 port and a 10 GBps Thunderbolt interface. Buffalo's MiniStation Thunderbolt will be available in 500 GB and 1 TB, at an RRP of £169.99 and £199.99, from retailers including Dabs, Amazon and eBuyer. Cloud-based ecommerce platform Actinic Online, has launched a free add-on application to integrate Sage 50 Accounts 2012 into Actinic Online. Import products, images, descriptions, stock level, re-order level, VAT, weight, EAN code, costs, categories and sub-categories from Sage 50 Accounts and transfer this information into Actinic Online. Upload customer records from Sage 50 Accounts to Actinic Online and retain allocated discounts. Transfer orders (sales orders and invoices) from Actinic Online directly into Sage 50 Accounts for processing, matching existing customer accounts or creating new ones. Simon Armstrong, Actinic's marketing manager explains the benefits of the integration: "Merchants using Actinic Online can now streamline their online business operations by integrating with their Sage accounting system. They also cut their costs as orders are fulfilled more quickly, plus they no longer have to enter data twice, so save time and reduce input errors." ZAPP is a new iPhone app from Zoom Creates designed to help you create the most effective presentations. The app utilises 10 years of research, thinking and content and has been tested with 71 international businesses and organisations including Starbucks, 3, Sapient and Argos. Once ZAPP has been downloaded, users are asked a short series of questions about their presentation including 'What is the purpose of your presentation?' and 'Who are you presenting to?' They're then guided through a series of options that enable them to custom design a brilliant presentation in 5 minutes. To purchase ZAPP for £4.99, go to the App Store and search for ZAPP business. LogMeIn, has updated its IT automation and management product, LogMeIn Central, that makes it easy to monitor and manage hundreds of versions of anti-virus from a single remote dashboard. Additional information, including a video demonstration of the new capabilities, is available at LogMeIn's product blog. New versions of LogMeIn Central featuring the new Anti-Virus Management capability are immediately and the new capabilities are available as a free update to existing LogMeIn Central users.